After buying a new iPhone (the new iPhone 8, iPhone 7S, iPhone 7S Plus etc. ), if you want to dispose of your iPhone either by giving it away, you must ensure that your personal data and files are safe. What to do before giving away your iPhone? You need to completely wipe off every iota of your personal details in the device. To do this, you have to first back up your data to iCloud and/or iTunes before erasing them from your iPhone. A general reset can used to erase the data and files. To see if the reset worked, set up your iPhone after the general reset and see if there’s any trace of data on it. If you wouldn’t find a thing. Now you can give out your iPhone. If not, do the following 3 thing. Step 1: Connect your iPhone to computer and open iTunes. Step 2: Click on your device’s name from the top-left. (This may not be necessary if the summary tab shows up). Step 3: Click on “Back up Now” at the right side. Be sure that “Encrypt iPhone backup” is disabled. It’s very important to disable Encrypt iPhone backup because it erases saved passcodes from the backup. This prevents you from having to enter the passcode to get it started when you restore the backup to a new iPhone. This is useful as a precautionary step in case you didn’t use the old passcode when setting up the new iPhone. iCloud gives the opportunity to restore your backed up files or data from anywhere, so far it has Wi-Fi connectivity. Step 1: On your iPhone, go to “Settings > iCloud > Backup. 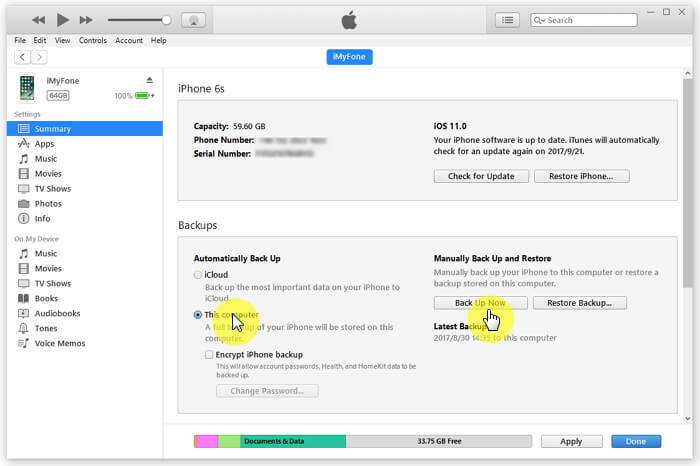 Step 2: Switch “iCloud Backup” on and click on “Back Up Now”. Step 3: If “Back Up Now” button is grey, make use that your iPhone is connecting to Wi-Fi. What to do before giving away your iPhone? Backup will help you to set up your new iPhone easily while permanently erasing all data on iPhone is the most important thing. Step 1:Launch “Settings” and click on “General”. Step 2: Scroll to the bottom of “General” and click on “Reset”. Step 3: Tap on “Erase All Content and Settings”. Step 4: If one is set, enter the iPhone passcode, and tap on “Erase iPhone” to confirm the reset. 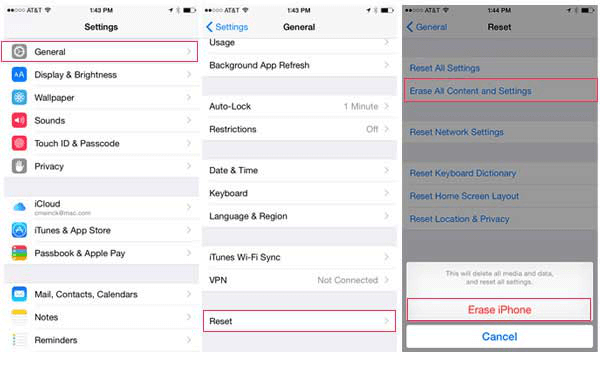 “Reset” on iPhone is easy to do. However, there is another safest way available to permanently erase data or files, with the help of iMyFone Umate Pro or iMyFone Umate Pro for Mac . This program is strongly recommended especially when you want to give away your iPhone. There are lots of advanced recovery tools which can help some users to retrieve data. However, bad guys can also use it for bad intention. That’s why iMyFone Umate Pro comes. It can protect any iOS data from being retrieved via any recovery tools, which means a lot if you want to give away your iPhone. Erase All Data Although the factory reset option on the iPhone can be used to remove, erase or delete data or files. These deleted files can be recovered through the use of third party applications. iMyFone Umate Pro iPhone data destroyer can be used to permanently erase these files or data and prevent them from recovery. iPhone “Reset” or iMyFone “Erase”? If you rely on Reset as the way to erase your iPhone data, then you may be disappointed because there are many applications out there with the capability of recovering hidden and deleted data from iPhone. iMyFone Umate Pro is a professional iPhone data eraser software that ensures complete and unrecoverable erasing of your data or files, protecting your privacy from being exposed. It completely deletes the file to the extent that it cannot be recovered. It can help you to better manage your iPhone content in a smart way. You have the advantage of previewing your selected options to prevent you from mistakenly erasing something important to you. Previously deleted files can be found out and totally erased. So now, you would be clear about what do to before giving away your iPhone: back up iPhone data first and then permanently erase everything from iPhone.